Titia de Lange, a cell biologist who studies how the ends of chromosomes are protected from damage, will be honored with the Canada Gairdner International Award, given for significant discoveries in medical science. de Lange, who is Leon Hess Professor and head of the Laboratory of Cell Biology and Genetics, is one of six recipients of the award this year; each will receive $100,000 CDN. The Gairdner is Canada’s highest scientific award and is considered among the most prestigious international prizes in science. de Lange is being recognized for her discovery of the mechanisms by which mammalian telomeres are protected from deleterious DNA repair and damage responses. Telomeres are repetitive sequences of DNA at the ends of chromosomes that protect a cell’s genetic material from molecular attack, often well-intentioned repair complexes that may mistake chromosome ends for DNA breaks that need to be fixed. de Lange discovered that telomeres are bound by a complex of proteins she named shelterin, and her work has established how distinct shelterin subunits repress different DNA damage response pathways that threaten the integrity of the genome. 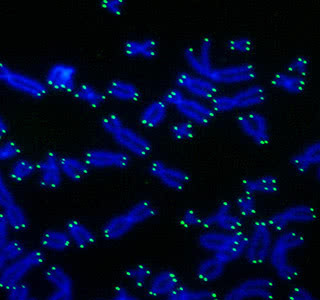 Human telomeres as seen through a fluorescence microscope. A native of the Netherlands, de Lange is an American Cancer Society Research Professor and the director of the Anderson Center for Cancer Research. Her many honors include the 2013 Breakthrough Prize in Life Sciences, the 2012 Dr H.P. Heineken Prize for Biochemistry and Biophysics, the 2011 Vilcek Prize in Biomedical Science, the 2010 AACR Clowes Memorial Award, the 2008 Massachusetts General Hospital Cancer Center Prize, and the 2005 NIH Director’s Pioneer Award. 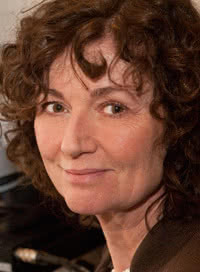 She is an elected member of the Royal Dutch Academy of Sciences, the European Molecular Biology Organization, the American Academy of Arts and Sciences, and a foreign associate of the National Academy of Sciences. The Canada Gairdner International Awards were created in 1959 to recognize and reward the achievements of medical researchers whose work contributes significantly to improving the quality of human life. The awards will be presented at a dinner in Toronto on October 30 as part of the Gairdner National Program, a two-week lecture series given by the award winners at 24 universities across Canada, making the superstars of science accessible and inspiring the next generation of researchers. de Lange will be the 18th Rockefeller recipient of the Gairdner. Recent winners include Jeffrey V. Ravetch and Michael W. Young in 2012, C. David Allis in 2007 and Jeffrey M. Friedman in 2005.